I've come to truly look forward to your questions. Summer is the best time to send them to me at cweber@assetstrategies.com. I will take a thorough look at each and every one of your inquires and give you an in-depth answer. I think you'll enjoy the useful and surprising information that came out of this month's questions. • in any one investment. Because of recent policies and legislation, such environments have become increasingly more difficult to find. Fortunately, our co-founder, Michael Checkan, anticipated the problem and created a unique program especially suited for personal funds that are not currently needed, but may be in the future. You may be surprised to discover our suggestion is Rare Tangible Assets (RTA), specifically rare stamps. Our program's features fit your bill perfectly. ASI is the North American Representative for Stanley Gibbons, Ltd., the world's largest rare stamp dealer. As such, our program includes building a handpicked rare stamp portfolio for you under the watchful expertise of Stanley Gibbon's Investment Manager, Geoff Anandappa. Your stamps are stored offshore in the Channel Islands, London or Hong Kong in secure and insured facilities which meet all the humidity, light and other storage requirements to preserve the condition of your rare stamps. There is no storage or management fee. This is not a stamp collection program; this is a portfolio program with built-in liquidity. Should you need to sell your stamps, Stanley Gibbons will buy them back, sell them at auction for you or find you a buyer. You can always sell them on your own, as well. 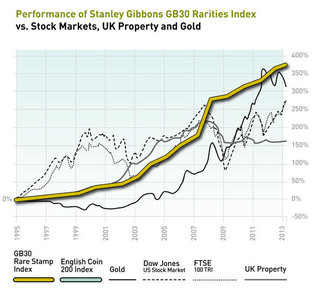 Only upon sale will Stanley Gibbons realize a profit based on a sliding scale percentage of your profit, with their percentage decreasing the longer you hold the stamps. Stanley Gibbons has created the GB30, an index of the thirty rarest and highest valued UK stamps and the GB250, which tracks a broader portfolio of British stamps. Both indices are followed by financial professionals worldwide and are quoted on Bloomberg Financial. The GB30 shows an average compound annual growth of 10.1% over the past 40 years, and the GB250 11.01% over the last 10 years. The stable, uncorrelated, long-term growth you see above is no accident. When you call to find out more about rare stamp portfolios, be sure to ask about non-correlation. That question has befuddled many people, as the 'karat' and the 'carat' are homonyms, but mean very different things. To add to the confusion, they both relate to jewelry and other precious tangibles. A 'carat' is a measurement of weight used for precious stones, like diamonds. A 'karat' is used to express the purity of metals like gold. A 22 karat Gold Eagle coin very definitely contains a full ounce of gold. When weighed, it would clock in at about 1.2 ounces. In most fabrications, pure gold must be mixed with another metal to make it harder. The Gold Eagle was always a coin meant to be circulated. It is currency minted with the expectation it would have a lot of handling. So it is minted with an added alloy of silver and copper. It is this added alloy that gives the Gold Eagle its 'extra' .2 ounces of weight. The rest is a full ounce of pure gold. Jewelry is an area of precious metals where you encounter differing karat profiles. The standard in the U.S. is the 14 karat gold ring or bracelet. In Italy18 karat gold jewelry is more often sold. Men's rings, especially for golfers or sportsman, may be 10 karat gold, to withstand harsher use. 24 carat gold may be too soft for everyday wear; although you may find it in Indian ceremonial jewelry. So you see, its 22 karat purity does not reflect negatively on the value of the Eagle. You can purchase Gold Eagles in and out of an IRA through our online platform, ASI Precious Metals Direct program at www.ASIPMDirect.com. It takes less than 10 minutes to create a relationship which allows you to purchase online during regular trading hours, and access your account information 24/7 from a tablet, smart phone or computer anywhere in the world. IRA holdings can be stored in New York City or Salt Lake City in secure 100% insured depositories. In fact, due to the immense popularity of the gold American Eagle coin, it is the only coin we allow to be stored in Zurich for your ASI Precious Metals Direct IRA. August 22-24 - Los Angeles at Stansberry Society Meeting; get details by calling us at 877-340-0790 regarding this private club. Call us at 877-340-0790 or email us to set up a meeting with Michael or Rich. Take action to discover more about how rare stamps can build a steady offshore portfolio which offers privacy, growth and liquidity. Check out your jewelry and coins and keep a record of their karat content to understand their durability. Call us for your American Eagle and other precious metals purchases at 877-340-0790. Visit www.ASIPMDirect.com to see how our ASI PMD program can make your precious metals transactions easy and convenient. Please arrange your meeting with Michael and Rich. They look forward to seeing you in person.